First, I love machines. The loom won out over the pottery wheel with the coming of children. Once I walked into a loom room, and saw the way it looked, the things it could do, its parts, etc., I was hooked. I now own and weave primarily on an AVL professional 8-harness rug loom with a dobby mechanism, pneumatic tensioning system and a worm gear. See how I love the parts! Next, I love the materials. From the strong smooth cotton warp to the luster of hand-dyed wools and the sparkle of silks, I continue to be enraptured with the feel and look of textiles. I’m becoming captivated by some unusual materials – stainless steels, paper and UV changing fibers. These will find their way into future work. Color is a source of constant joy for me and I delight in the full range of its use – bold and surprising color combinations and the subtle gradations of a single color. The colors and the unique quality of light in the Southwest, and the diverse forms of its land and sky scapes, make up a rich and diverse palette. Finally, I love metaphor. 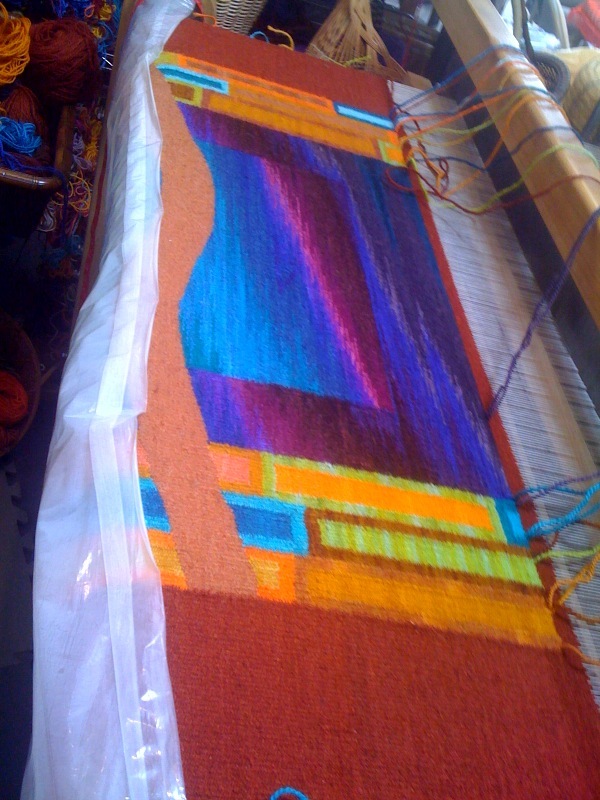 The very act of weaving has become metaphor – the web of life, weaving a tale – and is entwined with my choice of imagery and the use of the window set within a frame, a view to another place, another reality as a motif in my work. I try to achieve a blend of the representational and the abstract and to keep a geometrical contemporary feel in the frames.